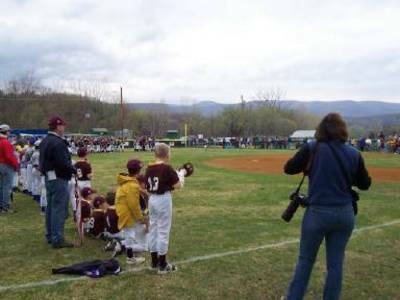 A record number of 133 boys and girls signed up for Williamstown's under-age-13 Cal Ripken baseball league and turned out for Saturday's opening-day program. That's 12 teams, and league manager John Benzinger says there's still room for a few more children. For the first time, Williamstown will host a state tournament, July 15-17. "Major league" (oldest player) games are Monday and Wednesday evenings and and Satuday morning at the league's Bud Anderson field. North Adams may be having a little trouble explaining the First Amendment to all of its city councillors, but at least nationally the word is out that the city is a one of "10 great places for big-city art, small-town feel." At least that was the headline in USA Today (circ. 2,309,853) on Page 3D of the Friday, April 29, edition. The half-page spread excerpted briefs about 10 small cities around America described in the book, "The 100 Best Art Towns in America: A Guide to Galleries, Museums, Festivals, Lodging and Dining," by John Villani (Countryman Press, $19.95). "Artists are leaving urban centers and revitalizing small towns, which now have a wonderfully plugged-in feeling," Villani, according to USA Today, writes in the book. "It's all about who lands in these towns -- that's what makes them fascinating." The USA Today blurb about North Adams reads: "Located in the northwest corner of the state, 'this very small community is actually an old mill town transformed into an arts mecca as the factories left behind were converted into exhibition centers for visual arts,' Villani says. 'The Massachusetts Museum of Contemporary Art (MASS MoCA) offers national and international contemporary art in dramatic and beautiful interiors.' 413-663-3735; berkshirechamber.com." The other nine communities listed: Hot Springs, Ark., Naples, Fla., Santa Fe, N.M., Marfa, Texas, Berkeley Springs, W.VA., Chico, Calif., Traverse City, Mich., New London, Conn., and Bellingham, Wash. When Chester "Chet" Oakes, 61, began delivering 38 years ago, it took him three hours to sort the mail for his ro ute, and he walked the whole way. Now, it takes an hour and a half -- even though the volume of mail has tripled -- and since 1972 he's driven a truck. Today is Chet's last day as a letter carrier on the west side of Williamstown around Main and Bulkley streets. Despite automation of sorting -- most mail is sorted in Springfield and trucked to Williamstown early in the morning -- and much greater volume of commercial ("junk") mail -- the basics of the job haven't changed, say Chet and Postmaster John Bourdon. For Chet, it's still a matter of knowing his customers. "He's been a self manager," says Bourdon. "I'm gonna' miss him." Chet figures he'll take the summer off at his North Adams home, and start in with some volunteer work in the fall. His route will go out to bid and will be handled by temporaries for a few weeks. Media consumers should turn to multiple news sources in order to filter opinion masquerading as fact, to find "real news" rather than mere entertainment, and in order to support "responsible journalism," says the first speaker in a new lecture series at Massachusetts College of Liberal Arts (MCLA). Former Wall Street Journal White House correspondent Ellen Hume, now teaching at UMass-Boston, delivered the innaugural MCLA Hardman Lecture Series talk on Thursday night entitled, "Talk Shows, Blogs and the Future of News." CLICK HERE TO VIEW FULL STORY. The 15-page document which Williamstown voters will use to consider the town budget on May 17 is available online as of this morning. The good news -- no one seems to think that a Proposition 2-1/2 override will be sought this year. The town's increasingly net-savvy clerk, Mary Kennedy, with a little help from informal "webmaster" Bill Barkin (day job: town assessor), converted the Town Warrant to a PDF and you can download it by CLICKING HERE. Besides the usual budget items, the warrant includes Article 28 (U.S.A. Patriot Act) and Article 29, which seeks the return from Iraq of Massachusetts-based National Guard units. For a few more details of what's in the warrant, CLICK HERE. GreylockNews.COM encourages town officials, Finance Committee members, and proponents of various articles (particular TIF financing for Wild Oats and the zoning changes) to post explanatory notes by clicking on the COMMENTS link below! A Buxton School graduate who co-directed a Peabody Award-winning documentary will introduce the fim next week (Wed., May 4) at 7 p.m. at Images Cinema in Williamstown. Marco Williams, will introduce "Two Towns of Jasper," about a brutal, racially-motivated beating in Jasper, Texas, in 1998. Sponsored by the Williams College, admission is "pay what you can." To read and print Images news release, CLICK HERE. UPDATE -- Sun., April 24 -- Matt Kelly of Lanesborough has posted a summary of Frances Moore Lappe's message last week. Read it.READ MATT'S MESSAGE BY CLICKING HERE. UPDATE -- 12:30 p.m. Friday -- WilliNet expects to be able to cablecast the Lappe talk. Watch here for a post with date/time. Frances Moore Lappe spoke at Williams College on Thursday night, April 21. There were lots of people there, but apparently no reporter for The Berkshire Eagle. Can the community fill in the gap? If you were there, tells us what this famed environmentalist said. Click on COMMENTS below to post. Thanks! UPDATE (04-27-04): Berkshire Eagle reporter Chris Marcisz has checked back with Adelphia in Colorado and their PR person apparently now has her story straight -- ALL of the Adelphia franchisees in Berkshire County -- including South County -- are proposed to become part of Time Warner. UPDATED (04-23-04): North Adams Mayor John Barrett says cities and towns which are part of the Comcast/Time-Warner/Adelphia merger and spinoff have 120 days to give their approval locally. Also, and to clarify, Adelphia's spokeswoman told GreylockNews.com on Thursday that she understood it was all of the North Berkshire Adelphia franchise (including Adams and North Adams) which would go to Time-Warner, even though their corporate PR documents call it the "Williamstown" system. Finally, Consumers Union's website www.hearusnow.org has an excellent piece on the dangers of cable consolidation. CLICK HERE TO READ EARLIER VERSION. Street art: Was it a Williams student, Angelina, who completed this snow-like block of history? Take a walk on Spring Street in Williamstown and you'll encounter a pair of snow-like blocks, about five feet hig h and each about two-feet square, painted white and with blue lettering. The lettering recounts major snowstorms of the last center in the region. Who did this piece of sculpture -- so appropriate now that we aren't shivering any longer? Neither Roger Tatro in the Williams College Buildings and Grounds Dept., nor Beverly Sylvester in the art department know. But here's a clue: Beverly says try talking to Williams student Bruce Inman, (bryce.inman@williams.edu) who is in charge of a student public-art initiative. Stop to to GreylockNews.COM and see if the mystery is solved. I am looking for renters for my home on upper Henderson Road from September to June. 1830's home, restored, warm, rustic/ two floors, large masterbedroom with adjoining bath, 3 bedrooms with shared bath, 1/2 bath on first floor, large kitchen, very large playroom, large living room/dinning area, separate laundry room. Completely furnished!! Quiet, narrow road, families and children in the neighborhood, stream in the backyard. School bus stop in walking distance just down the road. Great neighbors! Call Beth: 413-458-4044.